Marjorie B Collins was born on July 23, 1929 to Richard Cornileus and Mattie Leora (McKinney) Boswell in Pryor, Oklahoma. She departed this life on March 19, 2019 in Siloam Springs, Arkansas at the age of 89. Marjorie was one of eleven children and a lifetime resident of Mayes County. She graduated from Pryor High School in 1947. On December 26, 1950, she married Marion Collins in Benton County, Arkansas and from their union came two sons. 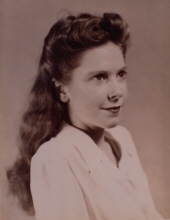 Marjorie later went to work at Medical Center Pharmacy in Pryor, where she worked until retirement. She enjoyed sewing and crocheting. She also loved Thunder basketball. Above all, she loved her family. Spending time with her grandchildren and great grandchildren was her greatest joy. Marjorie was a devoted wife, mother and grandmother and she will deeply missed by all who loved her. She is survived by her two sons, Michael M. Collins and wife Jackie of Pryor and Timothy D. Collins and wife Mary of Yukon; four grandchildren, Heather Johnston and husband Shane of Siloam Springs, Christopher Collins and wife Jennifer of Tulsa, Jesse Collins of Yukon and Jayne Collins of Yukon; three great grandchildren, Brock, Brett and Brycelynn and several nieces, nephews, other relatives and friends. She is preceded in death by her parents, Richard and Mattie Boswell; her husband, Marion; siblings, Ellis Boswell, Iva Boswell, Lilia Boswell, Orvel Boswell, Floyd Boswell, Richard Boswell, Leo Boswell, Leora Boswell, Andrew King and Arthur King. To send flowers or a remembrance gift to the family of Marjorie B Collins, please visit our Tribute Store. "Email Address" would like to share the life celebration of Marjorie B Collins. Click on the "link" to go to share a favorite memory or leave a condolence message for the family.